Do you frequently need to compare or synchronize your databases? Read this tip by SQL Server expert Roman Rehak to learn the secrets of effective database synchronization using SQL Compare. There are several tools on the market to assist in this task, as well as some homegrown scripts floating around. 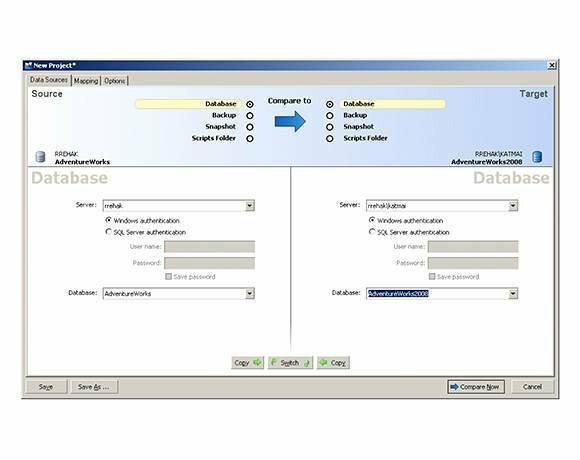 One tool is SQL Compare from Red Gate Software Limited. IT administrators will benefit from database synchronization in several situations. During the database development process, you may want to compare the development database and the QA database and generate scripts to bring QA to the same level of quality as the development database. Similarly, once the QA process is finished, you often compare QA to production and generate database change scripts for execution when the new version of the application is ready for deployment. You may want to keep track of all changes and maintain change scripts manually, so even if you decide not to use this type of software for synchronization, you’ll be able to compare databases to make sure you didn’t miss anything. 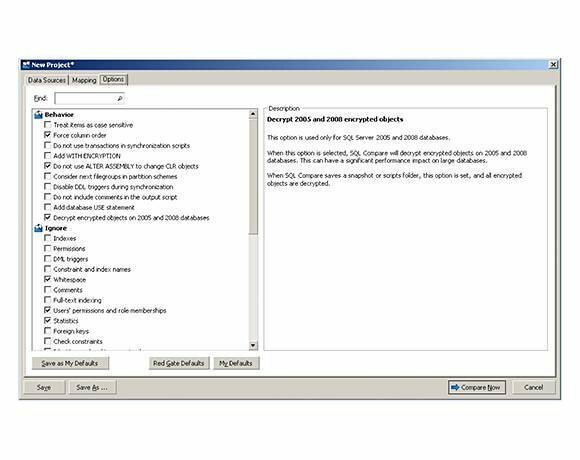 The SQL Compare tool offers you a quick, easy way to compare selected objects or all objects in a database and produce a script that will synchronize them. Each comparison of database A with database B is treated as its own project. When you finish comparing and possibly synchronizing, you can save the whole set of selections as a project. The project saves things like source database, destination database and the comparison options you selected. So if you need to work with the same two databases in the future, you can simply rerun the comparison with the same options and filters. When you use SQL Compare to start a new project, the first screen (shown in Figure 1) lets you select the source and destination databases. One of my favorite features in SQL Compare is the vast selection of objects you can choose to ignore during comparison as well as the number of options defining what should be included in the final script. For example, if you want to compare a production database with a QA database, it’s handy to exclude permissions from comparisons; after all, it’s very likely that you use different logins and users in those two environments. Once you’ve compared the databases, you’ll get results (see Figure 3). SQL Compare categorizes all objects into four areas: objects that exist in both databases but are not the same; objects only in the source database; objects only in the destination database; and identical objects in both databases. You can browse through and examine the differences. You can also use the filter on the left to eliminate specific types of objects from the view to make it easier to find something. Also, you can narrow down the list of compared objects and exclude individual objects from synchronization. 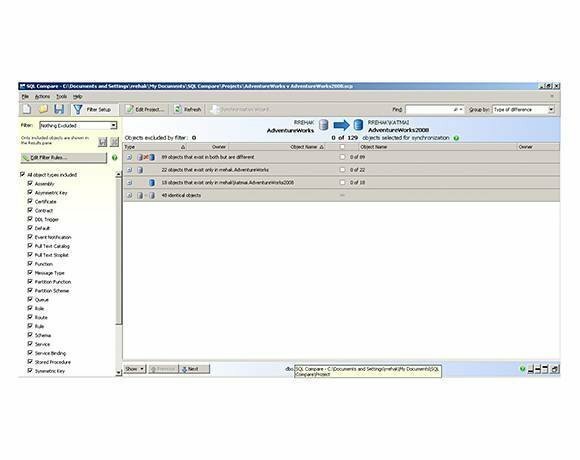 To synchronize databases, just start Synchronization Wizard from the menu. The button on the toolbar remains disabled until you explicitly select at least one object for synchronization. The wizard gives you two options: (1) to create a synchronization script for you, or (2) to let SQL Compare execute the scripts directly into the destination database. But, as I always stress, you should never fully trust generated scripts. Unless the database you are working with is relatively unimportant or you are sure you can quickly restore it from a backup, you should always save generated scripts and examine them. There are a number of concerns, and a visual inspection can prevent an incident; the script may not do exactly what you wanted, or it could contain code for objects you don’t want to create on the destination (for example, permissions or users). The best scripting tool provides options, and each selected option means more code. Visual inspection of generated scripts will ensure that the code is what you wanted -- and only what you wanted.